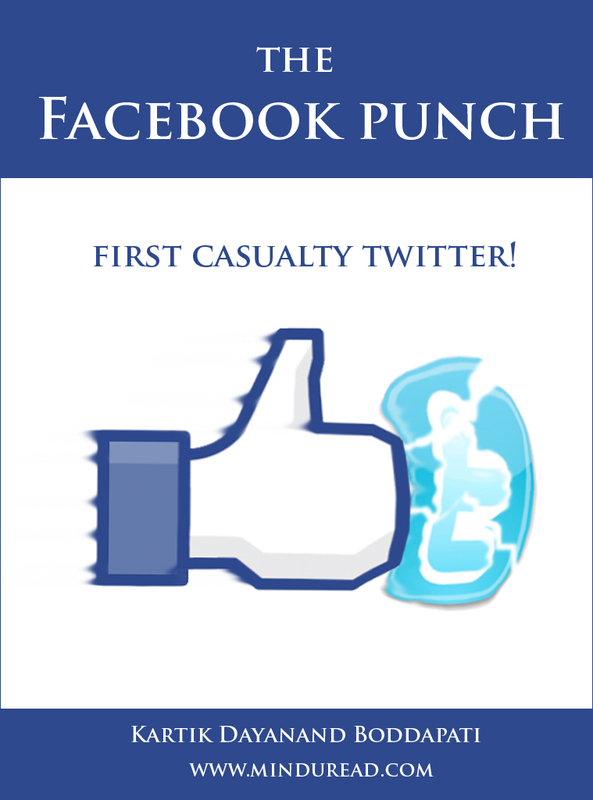 The Facebook Punch: First Casualty Twitter! Couple of months back I wrote a blog post called “The Future of War: A Digital Doomsday” where I mention that future wars would be fought in the clouds and giant corporations would try to eat each other, in the process only one of them emerging the clear winner. It already looks like Facebook has laid out the framework for its next assault and the first major casualty would be Twitter, followed by Google. One would be mistaken to think it is better technology that is driving Facebook but the fact is, the roots of the future success of Facebook lie in the very nature of human behavior. I will speak in great detail about that in my next post but in this post I would like to specifically talk of how Twitter is on its path to annihilation because of Facebook, and why it is very important for Facebook to do what Twitter does currently. 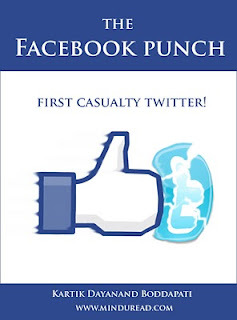 That was the title of my first blog post this year talking of the immense powers of Twitter. Unfortunately I am also writing its obituary at the end of the same year. When I say Twitter will be finished I don’t mean the concept of Twitter will be finished, but the service and the company ‘Twitter’ will find it hard to survive once Facebook makes it’s most critical change to its site. A change that would make Facebook far more exciting and talked about than it already is. The uniqueness of Twitter lies in the way its communication channel is structured, everything on Twitter is transparent and anyone can choose to follow or write to anyone without the mandatory friend requests or other such formalities. It’s an open world and being on Twitter is similar to participating in Big Brother/Boss, everyone can see what you are upto. It is the perfect medium to interact with strangers and celebrities and it is definitely far more exciting to hear the opinions of strangers than the people you know in real life. The entire crux of Twitter lies there, the uncertainty and serendipity of anything happening anytime, only the ones who use it actively know what I am talking about and would agree with me. Now let’s see how Facebook compares with Twitter. Sadly none of the above things are possible. All communication here is primarily between friends whom we know in real life or in a group that we are part of. It has settings through which our information can be seen by anyone, but for someone to keep track of what we are doing on a regular basis is quite a tedious task unless they are connected to us as friends. In effect Facebook is a closed community with focus on privacy and anyone unknown to us is seen with suspicion. So if everything is so perfect and exciting with Twitter and if Facebook is nothing but a not so exciting extension of our real life where is the clash between the two? Before I go on to talk of how Facebook is going to change this equation forever, I shall speak of few more things about Twitter. While Twitter might seem the perfect medium to interact with strangers it could also turn out to be a lonely place. A major shock that most people encounter is the amount of followers one can gain on their own merit. The connection process is one way and it is not necessary that the person you follow has to follow you back. Even your own friends would not choose to follow you unless you are speaking sense there. And people who follow you today might suddenly decide to unfollow you the next day; also to get a single response for any of your tweets would seem like a huge task for most people, it is like a culture shock in an alien land, leaving no incentive or reason to continue out there. And there isn’t much else that one can do on Twitter. Precisely for this reason Twitter has the lowest levels of retention amongst its users, with most people leaving the service shortly after joining or remaining silent spectators while a very tiny percentage of people actually contribute to the bulk of the conversations. Not a good thing for any service to function this way. So how will Facebook change it all and deliver the killer blow to Twitter? It is clear that the one thing Facebook lacks is the ability to easily connect and converse with strangers and with total transparency. Going by my observation of Mark Zuckerberg’s personality, I can safely assume that the current form of Facebook is not what he intends it to be eventually. Facebook is in the process of evolution and we are somewhere in the middle of this process. The above two basic functions of conversing with strangers and transparency are a critical aspect for it to reach where it eventually will. Now let’s see how he will achieve it. There are some basic tools of Facebook that drive all interactions. Few important ones are the status message window, share buttons and most importantly the LIKE button. LIKE is a feature that is gaining popularity more than any other tool and Facebook has made this button available to every website on the internet. Any piece of content today is LIKE’able, be it a video, article, photograph, message, website, etc. Facebook also has the feature of creating Fan pages for brands, celebrities, etc and one can connect with these sites by clicking the LIKE button. There are no boundaries or restrictions to LIKE any content anywhere. While the LIKE button is ominous all over the web there is one critical element that still does not have the ability to be LIKABLE. The 500 million users of Facebook don’t have a LIKE button on them yet. I read somewhere that with Facebook it is not a relation between a consumer and a product, the consumer is the product in Facebook. Imagine what would happen if one fine day Facebook decides to make all of its users LIKABLE, i.e. along with the option ‘add as a friend’ if there is a button that simply says LIKE, similar to the ‘follow’ button in Twitter, the entire dynamics of Facebook would change overnight. You would no longer have to send a friend request to a stranger and fear that it might be impolite or rejected, instead just go and LIKE the people you want to, and follow all their status updates which they choose to make public. It seems ironic to see all the fuss about privacy when we actually crave for transparency and hail something like the WikiLeaks as a triumph of journalism or whatever and want the world to live that way. So my views on this matter are pretty straight forward and it is a great opportunity for Facebook to clean up its act and tackle the whole privacy bit with a new approach. Sometimes when one takes two steps forward it is best to take one step backwards only to make a bigger leap ahead. The current privacy settings of Facebook are a little tricky and data that is meant to be totally private is sometimes displayed to strangers, especially photo albums in which one is tagged. The motivation or intention for leaving this little room for ambiguity seems to be the ability to create the excitement of peeping into what strangers are doing. With the introduction of the LIKE button on profiles, Facebook can clearly define only two types of relationships in its world, Friends and Likers. Friends are similar to our family inside the four walls of our house and what happens there remains only there, whereas the Likers are similar to people we deal with outside our house and this interaction is visible to everyone. By stripping the other complex equations of ‘friends of friends’ etc, etc, Facebook can create a simpler system consisting of only these two relations, one private and one public. The moment this is done, Facebook will be on fire and will hurtle towards its next goal with effortless ease and with lesser headaches to take care of. Will Twitter users migrate to Facebook so easily? It is said; in business it is important to be the first to develop something to make it a success. While there is some truth to it, it is not true in entirety. Think about it, what was the first commercially successful email application? It was HOTMAIL. Does anyone use it today? I doubt many would say yes. Gmail is the more preferred one purely because of the better service it offers. Same is the case with a lot of other technology companies, it isn’t enough to be first, what matters is the ability to innovate and provide better service and Twitter seems to be very slow in rolling out new features which will eventually lead to migration to a better service offering the same with additional perks. Surprisingly the perks here are not technology driven but more driven by human need to seek out and be accepted. What about all the celebrities on Twitter? Will they ever use Facebook? You would be surprised if I told you that the amount of following that already happens with celebs on Facebook is far superior to that on Twitter. Try this for a sample, the Oscar award winning music composer AR Rahman has 2.4 Million fans on Facebook compared to .29 Million on Twitter, Barack Obama has 17 Million fans on Facebook compared to 6 Million on Twitter, Lady Gaga has 24 Million Facebook fans vs 7 Million Twitter followers, name the celebrity and their fan pages on Facebook already have far more fans than they have on Twitter. It is clearly a matter of time before they realize the huge numbers of engaged audience they have on Facebook compared to the mostly inactive followers on Twitter. Twitter might soon become another Orkut. What I have spoken about in this post is only a tip of the iceberg. Looking at the length of this post I can conclude that I could easily write a book about every minute aspect of Facebook and how it will influence our lives in future in greater ways than we can ever imagine. However the most exciting part according to me will be my next post, the one which talks of why GOOGLE has to be really scared of Facebook and how the entire face of internet will change once Facebook implements its next set of major updates. Facebook has already given a clue this week, rather a glimpse into the future by changing the way our profiles get displayed now on Facebook; get ready for some earth shattering changes soon. Everything else on the internet will become irrelevant in the face of the Facebook juggernaut. Look forward to seeing your comments in the comments section below, you could also connect with me on Facebook and Twitter.